Buy your Vouchers for 2017 now! You may order them online by emailing us ( fk@rockschool.ie) with the recipients name, your address and telephone number. We will call you and take your payment over phone using Debit or credit cards and send you the voucher by email. 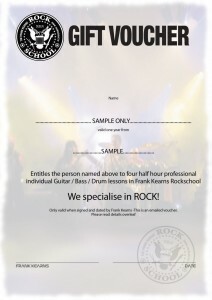 Vouchers are €110 each and cover four weeks of individual lessons one to one.